I looked at my Dad with surprise that customer has bought the product from our shop and it is his responsibility to pick it up, put on his motorbike and take BUT I did it since it was my Dad’s order. It happened in 1992 when I finished my 12th Grade (A Level) and wanted to spend 3 months break at my Father’s Pesticides shop. 17 Years spirited youth couldn’t control and asked Dad that why he asked me to do so. He smiled and politely told me, look son there are hundreds of shops with same product in the city but why our shop is always busy? My random guess rather careless reply “because you offer tea to every customer.” He took deep breath and gave me some tips “Your customer needs attention, care, respect and genuine product with honest advice” I always observed my Dad that whenever he had any customer, he left his seat, shake his hand with genuine smile and offered them seat (In Summer, turned fan towards him asked his assistant (Office boy) to bring cold water and in winter water followed by tea). Before asking what they want, he always asked about their family members’ health, children’s studies etc. Now who were these customers, they were uneducated or less educated farmers who come to buy pesticides for their crops. They were unable to identify a pure product because most of them were unable to read. I had always faced challenges while dealing with such people because they used to ask same questions many times but with the passage of time and Dad’s guidance, I was able to handle them and meet their requirements. After graduation, again I experienced three months break by serving these people and learned Pure Customer Service tips. My Dad’s Customer Service Focus paid me in my very 1st Hotel Industry interview in 2001 when I met with Front Office Manager in Intercontinental Hotel Riyadh, KSA for Front Office Associate position which went for 1 & ½ hour, originally scheduled for 15 minutes. The reason was my demonstration about customer service, when I quoted my real life experience while selling products to the farmers. I took the interviewer in the flashback when in front of me; I used to have 5 products with same chemical and same function but from different companies, different names with different prices and how I was able to sell the highest priced product to the customer. Another aspect which I learned was kind of customers. 1: Internal Customer 2: External Customer. My Dad always treated office boys (used to have 2 and now 1) with respect and never shouted at them, at their fault, taught them the right way and gave them chances to learn. Till today, whenever I go for vacation, I spend most of the time with him at his shop. In these 20 years, I have seen not only the same loyal customers’ or their sons but other people who came as a result of high recommendations. 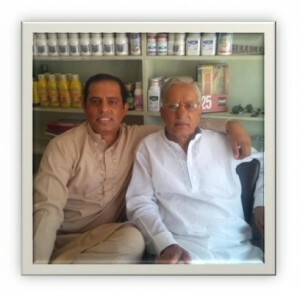 I have worked with Zaim Bhai and always found him respectful weather i am angry or upset regardless he has always guided me well how to handle the issue or compliant that’s for professional attitude and on personal level he is a very nice and humble person and will always give correct advice to you. I wish we have more people like him in this world.